Welcome to the March Newsletter from Hawk Miniatures, we have our next Assaye figure released this month more details below. It is also the run up to the start of our show seasons so below are the Model shows where Hawk Miniatures will be attending. This months release see the third figure in the Battle of Assaye series released. 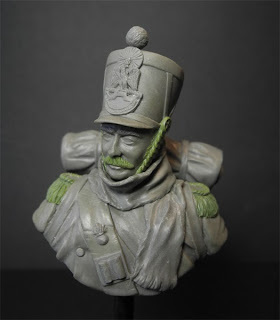 The figure is of Lieutenant Colonel Patrick Maxwell of the 19th Light Dragoons, this figure has been sculpted by Alan Ball and painted by Eddy Vandersteen. The last figure will be released in April with the whole set available at the BMSS show. Hawk Miniatures are proud to announce that we have been granted the sole distributor rights for a new model company and we will be posting their first products soon. But as a teaser the first two offering are small bust depicting French Napoleonic troops. The good news though as you are a member of our website you are able to purchase any of our preview kits before they are released. To place an order you just need send us a message through the website and we will send you a PayPal invoice for the amount, with a discount applied and free postage. Once the invoice is paid we will dispatch the order by first class mail.